The fact that people just love to hear stories is one reason why some of the Vedic codes were gradually transmitted in story form, like the epic histories Mahabharata and Ramayana and the Puranas. When such stories concern the pastimes of the Lord and His devotees, they are called lilas. Being labeled Lord Nrisimhadeva’s pujari in Mayapur, I have been asked to recount some stories in connection with Him, but unlike the sastras, these “lilas” have no authority except for the testimony of the devotees who told them. In most cases there were no other witnesses. Although I am generally quite skeptical when it comes to accepting other people’s mystical experiences as truth, just too many things started happening recently, not to sit up and take notice. For instance, during the last Gaura-purnima festival, I called over a mataji in the crowd and asked her to distribute the Lord’s caranamrita to the ladies, which she did. Later when she brought the caranamrita pot back, she remarked that Lord Nrisimhadeva was very merciful to reciprocate so quickly. “I was praying this morning that I might be able to offer some direct service to Him, and now you have given me this service.” “Yes,” I said, “desires are quickly fulfilled in the dhama. Just see, the same day you desire, it happened.” “No, not the same day — the same moment!” she replied. “The very instant I expressed that desire to serve Him, you called me over.” “Wow! That is amazing!” I acknowledged. “Did you hear about how Atmarati mataji’s eye problem was cured at the same time that Lord Nrisimhadeva’s original eyes were placed back, after one donor had bought Him new eyes? While I was hearing this, I noticed another devotee who had come for the darsana of the Lord. 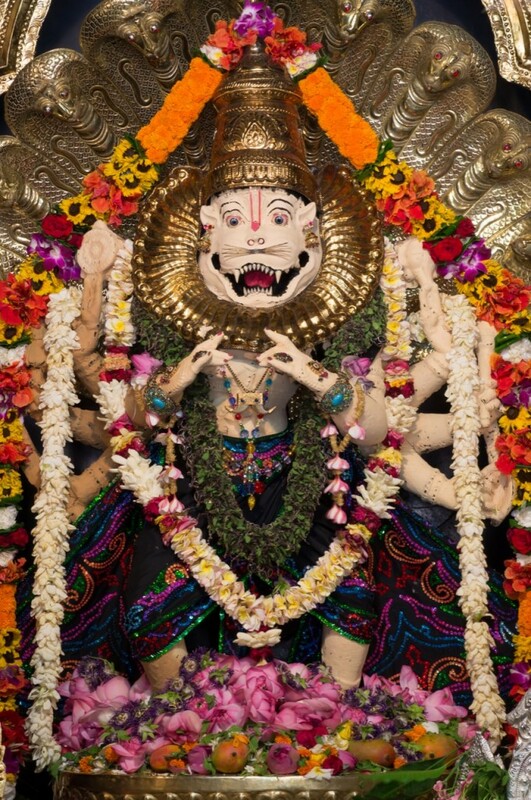 Earlier in the morning this mataji had asked my advice what to do, for she had been afflicted for about two weeks with a problem that contaminated her body, which wouldn’t allow her to paint some Deities in Assam, although she had already been commissioned to do it and had an air ticket to go. Some days later, another mataji came to the pujari room and told us about a dream, wherein Lord Nrisimhadeva walked and talked with her just like a father. When she asked how she could serve Him,He told her to offer Him some mangoes. About one week later when she brought the mangoes for offering, Jananivasa was telling some other pujaris how fortunate she was that Lord Nrisimhadev came to her dream and talked to her and held her hand while walking with her and gave her personal instructions. The Mataji then exclaimed. “Actually there was more to the dream than what I had previously told you. ‘Oh, don’t do that, please,’ I fearfully exclaimed. ‘We want him to stay here.’ ‘”No, I think I will take him back.“ And after my pleading with Him for long time, the Lord firmly announced, All right then, I will take one of the leaders instead. '” And now as you know just days ago HH Gaur Govinda Swami, who was a GBC, sannyasi and Guru suddenly left his body apparently by ‘heart attack’. I didn’t mention it before because I didn’t want to alarm anyone but now it has come true, I feel it is all right to tell you. When Lord Nrisimhadeva first came to Mayapur, all the pujaris were reluctant to worship His awesome form. 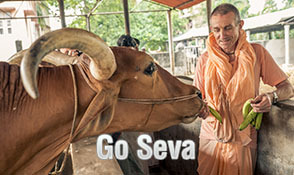 Bhava-siddhi Dasa was particularly frightened and always very nervous worshiping Him. One night, after putting the Lord to rest, he was leaving the altar, when he heard such a tremendous sound that it made his hairs stand on end. Looking back fearfully, he saw that everything was in place. So he quickly left, locked the door and paid his obeisance, praying for forgiveness for any offense he might inadvertently have committed. At the end of that night the shaking of his bed awakened him. Bhava-siddhi was sleeping on the top of a bunk bed. So he thought it must be the pujari below him, getting up for mangala-arati. 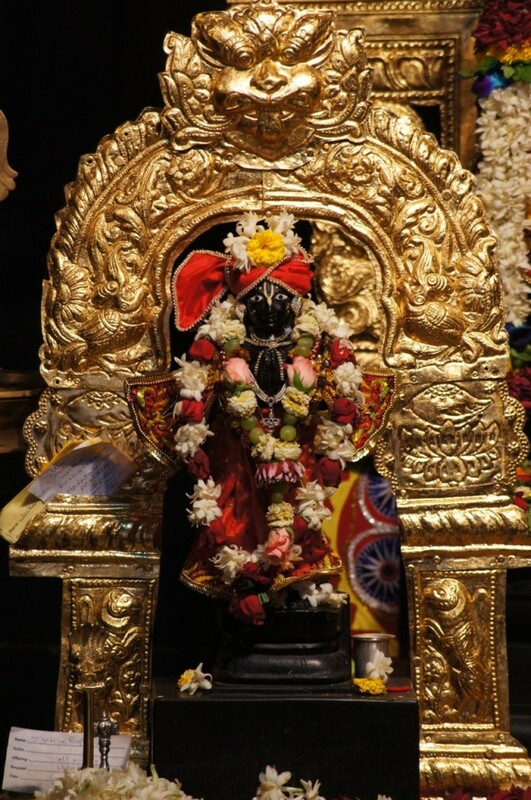 However, when he opened his eyes, he saw Lord Nrisimhadeva sitting on his bed. That fortunate pujari became very fearful, practically to the point of panic. As he tried to get up, Lord Nrisimhadeva placed His two hands, which felt like the weight of the universe, on his shoulders. The Lord then disappeared, but Bhava-siddhi began to run up and down the veranda of the Long Building, where he slept. “What happened?” asked some concerned devotees. But they received only incoherent replies. They started to think maybe he had gone mad or become haunted by a ghost. Finally, Bhava-siddhi ran over to the temple and prostrated himself before the door where Lord Nrisimhadeva is worshiped and offered heartfelt prayers. After some time, he became a little pacified and began walking back to his room. “I wonder why everyone is staring at me,” he thought. When he looked down the answer was obvious: he was only dressed in his underwear. 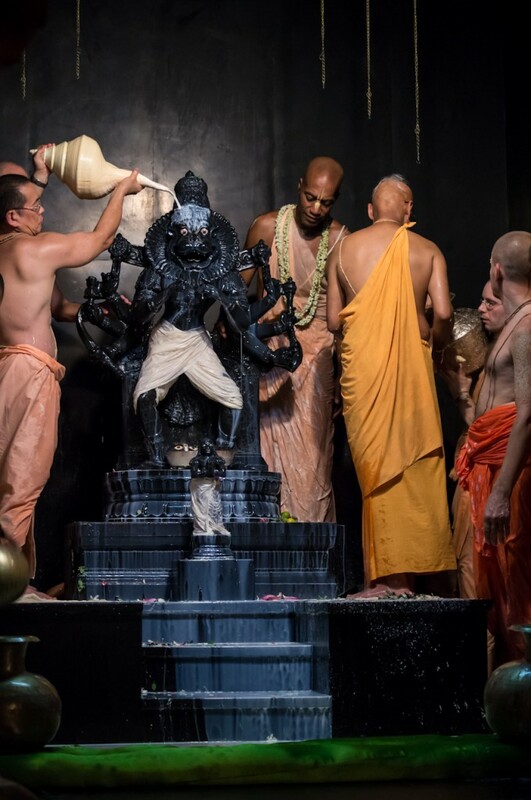 I saw Bhava-siddhi at last year’s Gaura-purnima festival — he is living in America now — and asked him about that incident. He wasn’t the only one to claim to have seen Lord Nrisimhadeva. Once, a devotee from a nearby Gaudiya Matha temple came to offer worship to Lord Nrisimhadeva and told our head pujari, Jananivasa, that on Nrisimha Chaturdasi (the appearance day of Nrisimhadeva) he had been staying up all night chanting. Then, at the end of the night, our Lord Nrisimhadeva manifested Himself in his room. Another time, the frantic parents of a runaway boy, after searching all over the country, finally heard that their son was at our Mayapur center. They immediately came and spent the whole day looking for him, inquiring at the reception desk and from individual devotees, but they were not at all lucky in tracing him. As these words left her mouth, a figure passed and stopped before her and Lord Nrisimhadeva: it was her lost son. Both parents have now accepted Vaisnava initiation started a nama-hatta center, and are enthusiastically preaching the Lord’s glories. There are other stories — some I would be hesitant to repeat, and others that I can’t, having been told them in confidence. The devotees who told me these stories have had their faith and conviction strengthened, and certainly mine was also. 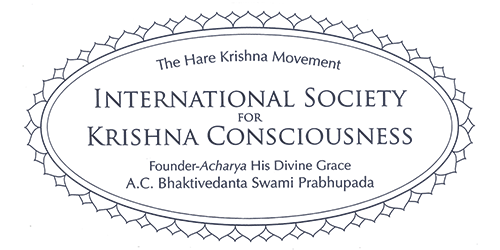 So if others derive the same result of helping us advance in Krsna consciousness, it will be most beneficial – even though they are not sastra.